RC & Kaydence , for those new to the names, let everyone know who you are and what you do. Kaydence– I am an artist and songwriter – Queens Native currently residing in LA. RC, give us a little background on you as an artist. When did you start? Who Influenced you? When did you know you wanted this to be your full career? RC – I grew up moving around Westchester County living in shelters with my mother and brother until I was able move and settle with my father in Peekskill, NY around 2003. I was in the 7th grade when I first started recording songs in my friends garage at the age of 11 and haven’t stopped recording since then, it was therapeutic for me. I remember having shoe boxes full of songs and ideas and just walking or riding my bike across town to my friends house who lived in a much nicer neighborhood just to see if he was home so I could record. I couldn’t afford a cell phone at the time so everyday was like a game of chance. But being in a better environment and having the chance to record a new record was worth it to me. I was greatly influenced by projects like Jay z’s “Reasonable Doubt”, Nas’s “illmatic”, Big L’s “The Big Picture” These taught me about word Play. but I was also inspired by movements as well such as Jermaine Dupri’s “So So Def” movement or Akon’s legacy with “Konvict Muzik”. Those really thought me at a early age that it wasn’t just about rapping it was also about making a great record that can be commercially promoted. I enjoyed that aspect the most, I wasn’t really into battle rapping or having the greatest punchlines out of everyone it was mainly about writing a dope record and just being able to express myself. This became a career for me early on, after my first talent show in 9th grade that’s when I knew for sure that this is what I wanted. The adrenaline rush, the fact that I can make money and be creative. I never saw myself staying at a desk job, maybe just to finance what I’ve always wanted but never as a career. Kaydence, you recently put out a dope project that got some great press and notoriety called The Pen Piper, what made you want to do another project so soon? How does it differ? So the new project is called ‘Retrograde’ what’s the concept? What do you want listeners to experience? R.C – Retrograde is us going back into our past situations and bringing them forth to the future. We wanted to reflect, Vent and tell our past stories with a twist of what’s going on with us in this present time. I would like to listener to experience something melodic and relatable. To me this has never been done in such a way. First single was ‘Bittersweet’ and that came with a dope video as well. What has the response been thus far from fans? RC– The response has been amazing! I remember trying to scramble within two weeks from the shoot to come up with a concept for that video. One of my good friends suggested the cooking show idea and I thought it was brilliant for two reasons. 1. 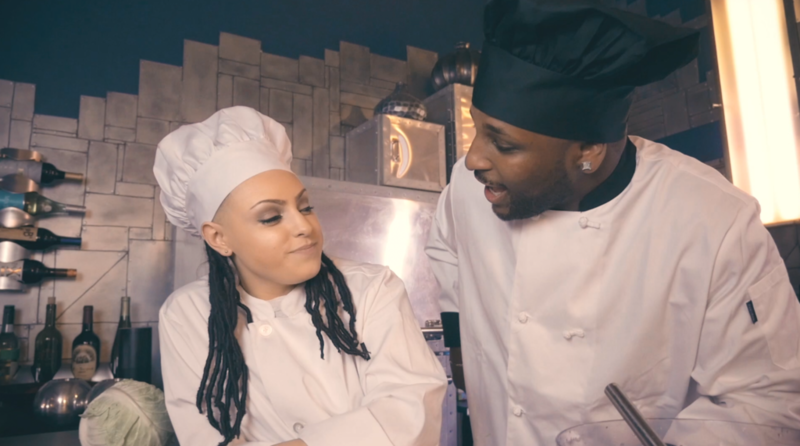 The lyrics coincided with the concept of the video “saucing on her that new girl know she got the recipe” 2. Me and kaydence would do a fake cooking show for fun on Instagram story before we’d hit the studio every day. From there all it took was finding chef coats and a venue in LA in which we were able to accomplish in a short time. What is each of your favorite song on the project and why? RC – hand down it would have to be “Options Open” I love the melodic bounce and the concept. It was so organic, we were both seem to dwelling over our x’s around that time. The creative process was simple she went in her corner to write and I went in mines and we came out with a really dope record. I’m actually writing the concept for that video as well. It’s a must! KK– “Reminiscent” for sure. I think I let out all my emotions on that one. Sometimes you have to look back and reflect on the journey. True story it is the last track we recorded. We would listen through and say “idk man something is missing… I need to vent more.” So Reezy Tunez cooked up a track specifically what we envisioned and actually used some of my vocal cops in the background. Felt like it fit perfectly, and I said everything I needed to say. What’s next for RC & Kaydence collectively and individually? RC – Collectively we will be shooing a few more visuals for the project. We have a private listenings in both LA and NY. And I will be defiantly trying to get this project to where it needs to be on a marketing aspect. I will also working on my solo project as well as song writing and checking for the response of this project. I would also like to do a part two if the opportunity presents itself. I love working with Kay and I think together we can accomplish something that’s never been done. KK– I think we’ll always find records to collaborate on in the future, but we’re definitely going to take time to mold our own sounds individually. I definitely wanted people to become familiar with RC not because he is my friend, but because he has the passion a lot of people “claim” to have. And that’s obviously rare. And I will always support and stand behind people that take music seriously. It’s all we have. Where can we find each of you online? RC– Huge shoutout to Kaydence for believing in my vision and giving me this opportunity. DX for his passion of videography and helping me bring my visions to life. Alan Burton for his creative abilities when it came to helping write the treatment of the “Bittersweet” music video. All the producers who are involved in this project! Diney, Austin, and more! Special shout out to Atlantic Records Studio for giving some insight on the music business and the opportunity to intern as an A&R. J Hatch for his leadership skills and helping us reach this platform. Tish Hyman for featuring on the album. Creative Digital Pub and Pro for the distribution of the album. Rance and 1500 or Nothing for always popping in on us and making sure we good! And anyone else that I’ve forgotten Thank You! KK– Shout out to my team- istandard, my manager J Hatch, create digital music for being a huge support. Shoutout to Anothr breed for standing behind me from the beginning. My friends and family back home. And to all the people listening that don’t have a voice- I promise to use my music to do that for you.